Pets that need to stay with us for treatment are looked after by our nursing team that comprises 27 qualified and trainee veterinary nurses. We have separate dog and cat wards that are staffed 24 hours a day, 365 days a year. Our team of dedicated nurses work overlapping shifts, ensuring that your pet always has supervision and care at all times. 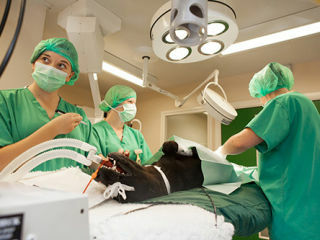 We always have a vet on hand to advise on any treatment that your pet may require.